The Bell, Florida-based horse rescue recently received a grant from The Right Horse Initiative, allowing them to expand their program to help more horses annually. Learn more about the programs here! Horses Without Humans (HWH) is a 501(c)3 nonprofit equine adoption organization based in Bell, Florida, accepting donated horses from rescue situations for rehabilitation, retraining and placement. Earlier this week, The Right Horse Initiative announced that Horses Without Humans was the recipient of a $200,000 grant, which will be used to help the organization expand its program. Currently, HWH can transition and adopt out about 20 horses annually; the grant will help HWH expand to be able to help around 100 horses a year — that’s quite the expansion! HWH provides a professional assessment of all horses that come through its program, rehabilitation and veterinary care, and training in basic groundwork and the foundations of dressage. HWH was founded in 2017 by dressage trainer Yvonne Barteau, a USDF Gold, Silver and Bronze medalist. 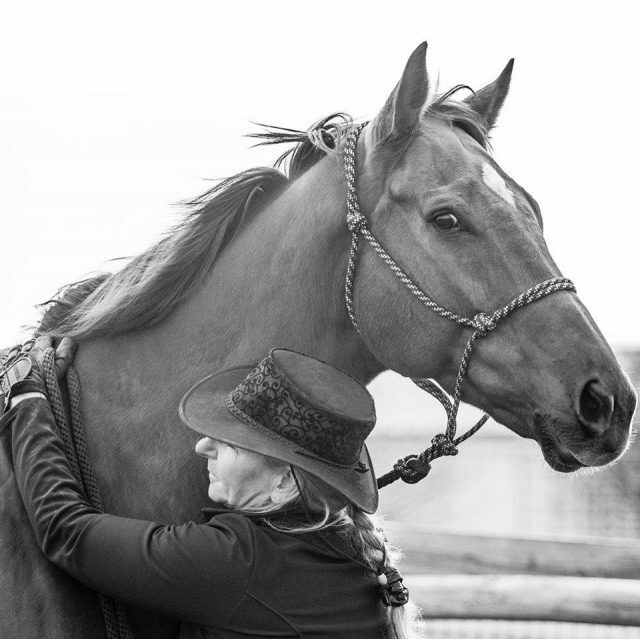 Barteau sees HWH as her opportunity to give back to the horse world after a successful career. Not only devoted to rehabilitation and adoption, HWH offers educational opportunities to horse owners and riders as well, with the belief that a more education horse industry is better-served to keep horses out of bad situations. About Horses Without Humans. Horses Without Humans (501c3) is dedicated to providing transitional horses a valid chance at an adoptive home. Located in Bell Florida at the 126-acre Rock Bluff Ranch, HWH is a training and education center for both horses…and their riders. With the help of The Right Horse Initiative Horses, without Humans has been able to expand on their ability to house and train their adoptable equines. The primary focus of Horses without Humans is to develop an intake, assessment, evaluation and training model which can be taught to others with hopes of improving equine welfare in the United States both short and long term.